The Gokhale Method uses healthy posture and movement to help you regain your structural integrity and regain a pain-free life. We are marvelously designed creatures. We have inherent grace and strength, like every other creature on the planet. Our bodies heal spontaneously, and if we respect our natural design, we can function well for close to a century. The Gokhale Method addresses the root cause of muscle and joint pain. Most pain can be attributed to how we hold ourselves and how we move. Since we aren’t born with a user’s manual, we rely on our culture to guide us. About a century ago, our culture took a wrong turn. 90% of adults experience back pain at some point in their lives. This year, 50% of working Americans and Australians will experience back pain. Back pain is now the leading cause of disability in people under 45 years old. By age 15, more than 60% of all adolescents have experienced back and/or neck pain. We have lost sight of what constitutes healthy posture; in fact, many popular guidelines for “good posture” are just plain wrong. Our ancestors knew how to move without pain. Babies know how to move without pain. Some cultures still know how to move without pain. This method educates you in a way that your culture does not, so that you can live a fully-functional, pain-free life. Effects are immediate and last a lifetime. Our multi-pronged approach will profoundly change your habits through simultaneous visual, kinesthetic and intellectual learning. You can forever reclaim the pain-free body you were born with. Most students find relief following the first lesson. Achieve results without time-consuming exercises or special equipment. By emphasizing everyday movement rather than periodic exercise sessions, the Gokhale Method gives you ample opportunity to practice without taking time out of your day. You naturally incorporate your newfound body wisdom into your daily activities and physical pursuits. Every movement becomes an effective exercise to strengthen and stretch. You will learn to sit, sleep, stand, walk, and bend in ways that protect and strengthen you instead of wear and tear you. Sitting will be comfortable, either with a backrest when you place your back in therapeutic traction (stretchsitting) or without a backrest, when you stack your spine on a well-positioned, anteverted pelvis (stacksitting). Sleeping will be comfortable and provide hours of restorative traction, whether lying on your back or side (stretchlying). Standing will be a resting position for most of the muscles of the body with the weight-bearing bones vertically stacked over the heels (tallstanding). A retroverted pelvis leads to tense back muscles or slumping. 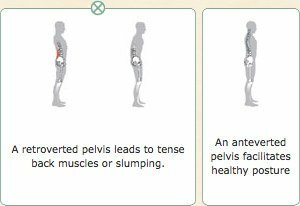 An anteverted pelvis facilitates healthy posture. Bending will involve hinging at the hip rather than the waist, exercising the long back muscles and sparing the spinal discs and ligaments (hip-hinging). Actions that challenge spinal structures, such as carrying or twisting, will involve deep layers of muscles in the abdomen and back (inner corset) to protect the spine. Walking will be a series of smooth forward propulsions, challenging the muscles of the lower body and sparing the weight-bearing joints throughout the body (glidewalking). In relearning these everyday actions, you will reposition and reshape your shoulders, arms, neck, torso, pelvis, hips, legs, and feet the way they were designed to be. You will develop a high level of confidence in and sense of control over your well-being (well-being is not consistent). Once you have learned the basic principles, you integrate them into all positions and movements. Your everyday activities will once again become therapeutic.